Short thin-walled CFRP columns with channel section were investigated in this study. The tested columns were subjected to compressive load, both axial and eccentric. Eccentric load was applied in two mutually perpendicular directions. The scope of the study included examining the effect of load eccentricity on the critical load of the column. 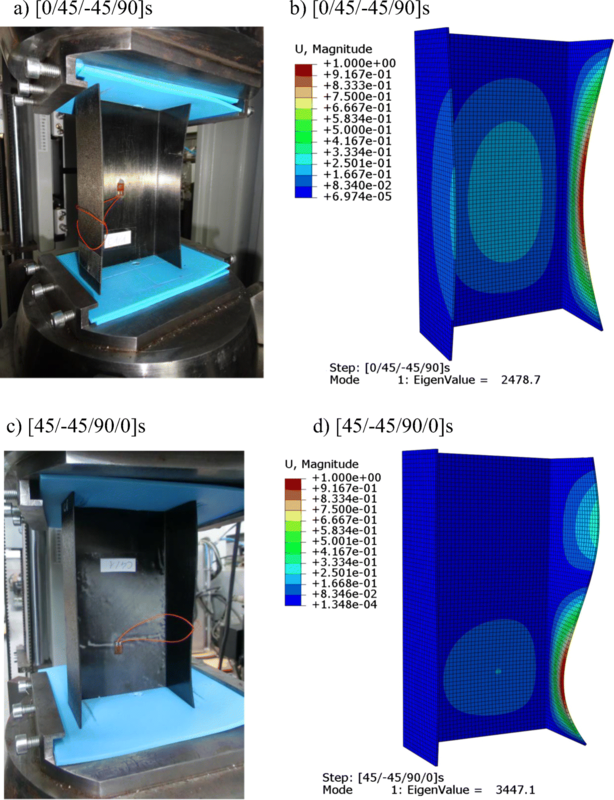 The study involved both experimental tests performed on physical models of columns created by the autoclave technique and a numerical analysis by the finite element method. The numerical analysis of critical state involved solving an eigen problem by the minimum potential energy criterion in order to determine the buckling mode and a corresponding critical load. For physical models, the critical load was determined based on tensometric measurements by Koiter’s approximation method. The numerical results were compared with experimental findings. The study determined the effect of eccentric compressive load on the critical load of the tested column and that of composite lay-up on the structure’s stability. Thin-walled columns of complex cross-sectional shapes are structural members with high strength and stiffness yet relatively low specific weight. They are widely used in aviation and automotive design to reinforce thin coverings by acting as a specific load-carrying framework of the structure. The primary assumption in the design of thin-walled columns is that they will carry axial loads, both tensile and compressive. Columns under compressive loads can either lose their stability or operate in a post-critical range, which greatly reduces their load-carrying capacity [1, 2, 3, 4, 5, 6, 7, 8, 9, 10, 11]. In light of the above, it is of vital importance to know the value of critical load under which the structure loses stability. It turns out that when it comes to real structures, the methods for determining critical loads are not well-established, which makes the design of such systems difficult [12, 13, 14]. An alternative solution is to perform FEM numerical analyses to determine critical loads [15, 16, 17, 18, 19]. In numerical analysis, the critical load is determined by solving a linear eigen problem in compliance with the minimum potential energy criterion. Moreover, to ensure the equilibrium path stability, the other variant of minimum potential energy must be positive. Another important aspect of stability analysis is that it must take account of real operating conditions of the thin-walled structure. This is due to the occurrence of various inaccuracies in real structures, including geometric imperfections, production inaccuracy, non-uniform boundary conditions and the eccentricity of compressive load [20, 21, 22]. In particular, under eccentric load, the structure operates in a complex loading state (compression and bending), which may cause the buckling to occur earlier than expected. 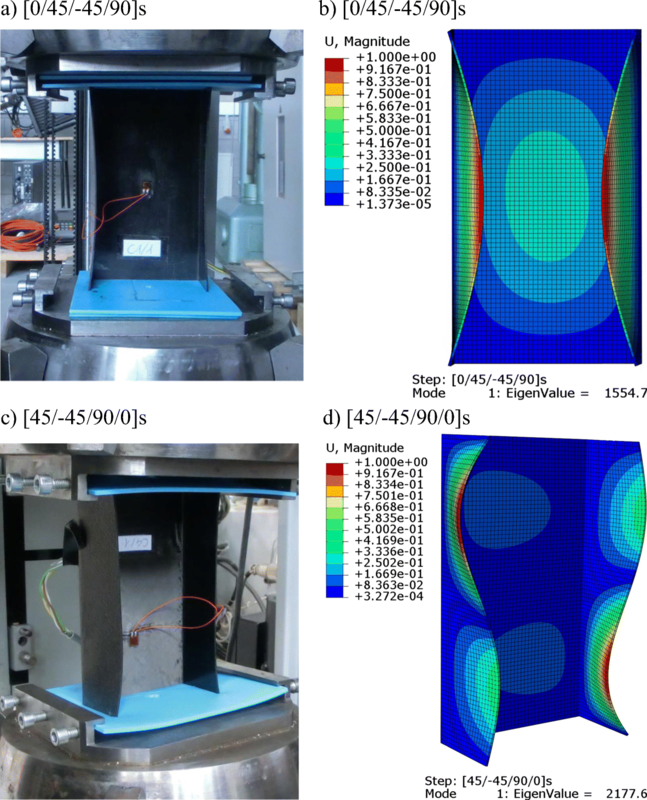 These problems are investigated by the authors of the present study, which examines the effect of eccentric load on the operation of a thin-walled channel-section column made of carbon-epoxy composite. 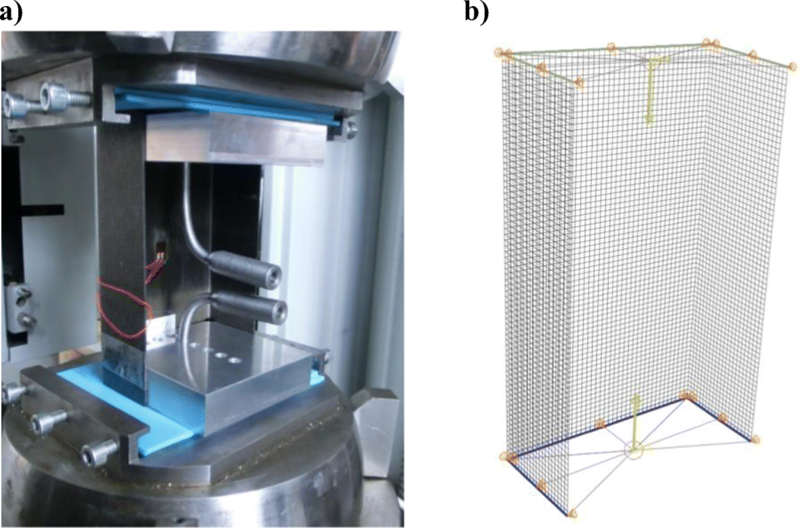 The scope of the study included experimental and numerical investigation of the critical state of composite columns under axial and eccentric load. 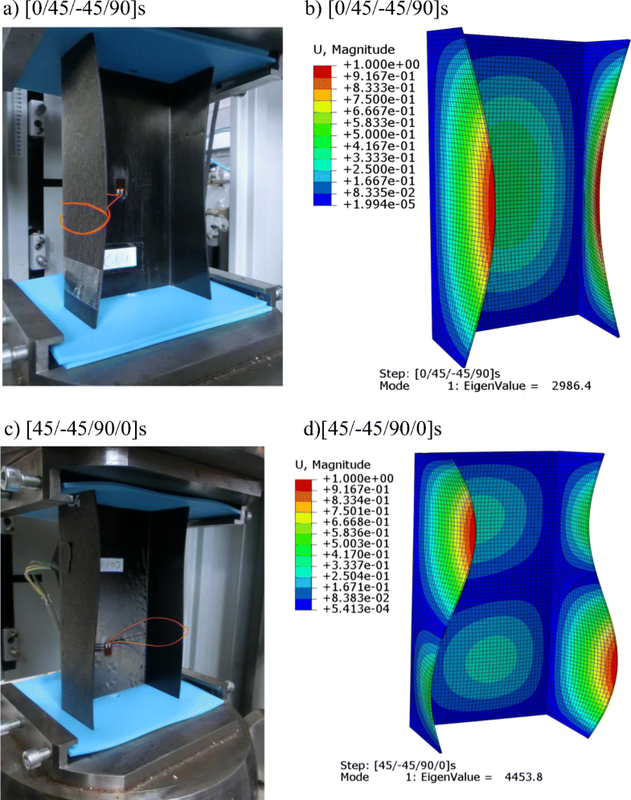 Obtained results enabled a qualitative and quantitative analysis of the stability of thin-walled composite structures with respect to their sensitivity to eccentricity of the applied load. The study was performed on a short thin-walled channel-section column under eccentric load. This column is a standard thin-walled structure with perpendicular walls made of flat plate elements that are joined on their longer edges [2, 19, 23, 24]. The tested columns were made of CFRP laminate by the autoclave technique. The laminate consisted of 8 plies symmetric to the mid-plane of the laminate. Two lay-ups of the laminate were investigated: [0/45/−45/90]s and [45/−45/90/0]s, characterized by the change in orientation of the  ply relative to the mid-plane of the laminate. The tested column was described by the following overall dimensions: w = 80 mm; h = 40 mm; column length l = 143 mm; and wall thickness t = 1.048 mm (Fig.1). Figure 1 shows a schematic design of the tested channel-section column and the axes e1 and e2 describing the directions of applied eccentric load. Eccentric load was defined as a displacement of the point of application of the compressive load in the end sections of the column relative to its centreline, in two directions: e1: 0 < e1 < 10 mm and e2: −10 < e2 < 10 mm. A single ply of the laminate was described the following mechanical properties: Young’s modulus in fibre direction – E1 = 130,710 MPa; modulus of elasticity perpendicular to fibre direction – E2 = 6360 MPa; Poisson’s ratio in ply plane –ν12 = 0.32; shear modulus – G12 = 4180 MPa. Direction 2: e2 = 0 mm, e2 = −5 mm and e2 = 10 mm. Figure 2a shows the experimental test stand equipped with elements enabling the application of eccentric load. In parallel with experimental tests, we performed a numerical analysis to develop FEM models suitable for determining the effect of eccentric load on the structure’s operation in a critical state. In numerical analysis, the eccentric load was applied in the range from 0 < e1 < 10 mm to −10 < e2 < 10 mm, every 1 mm. The discrete model of the column was created using 8-node layered shell finite elements, S8R, with three translational and three rotational degrees of freedom in every node. S8Rs have quadratic shape function and reduced integration. This type of finite element enables the definition of the laminate’s structure in compliance with a vector normal to the surface of the element. The numerical models were created using an orthotropic material in one-dimensional state of stress, based on experimentally obtained mechanical properties of the composite material. 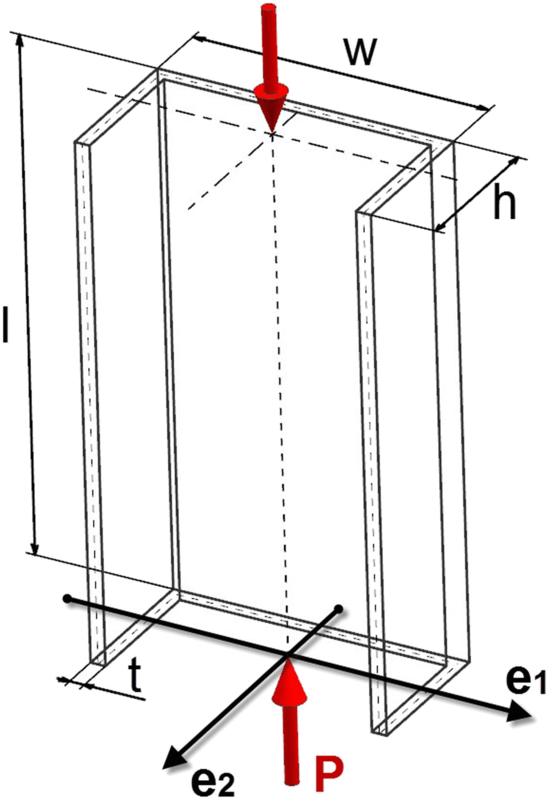 The boundary conditions of the numerical model reflect pin-jointed support of the column’s ends – Fig. 2b. Reference points were marked in the centres of gravity of the ends, and their degrees of freedom were linked with the degrees of freedom of the nodes located on the ends of the channel-section column. Three translational degrees of freedom were constrained for the point located in the lower end of the column (ux = uy = uz = 0). The point located in the upper end of the column was defined by the condition of uniform displacement of all ends in the centreline of the column, i.e., uz = const., while its other translational degrees of freedom were constrained (ux = uy = 0). The eccentricity e was described by changing the position of both reference points in the load eccentricity direction. The loading of the structure was realized by the application of load concentrated at the reference point located in the upper end of the column. Experimental tests provided information about the critical state of a real structure, reflecting the lowest buckling mode of the composite columns under compression. In every investigated case, the loss of stability was characterized by the occurrence of a specified number of half-waves in the axial direction of the column, describing the local buckling of both walls and web of the C column. Obtained experimental results enable performing a qualitative and quantitative analysis of critical state based on the recorded test parameters. The critical load of the real structure was determined via tensometric measurements by approximation methods. In FEM analysis, the critical load of the tested structure was determined via solving an eigen problem by the minimum potential energy criterion. The experimental results of critical load were compared with the numerical results obtained by FEM. A comparison of the experimental and numerical results for the investigated laminate lay-ups and applied eccentric loads is given in Figs. 3, 4 and 5. The experimental buckling modes show qualitative agreement with the numerical buckling modes of the tested structure. The investigation of critical state enabled the determination of the effect of laminate lay-up on the buckling mode and its corresponding critical load. Experimental critical loads were determined by Koiter’s method , in which the correlation coefficient between the approximation function and the experimental curve is set equal to R2 = 0.97, which points to good fitting of the selected approximation function. Obtained experimental and numerical results of critical load are listed in Table 1. The experimentally determined values of critical load for a real structure were compared with the numerical values obtained by FEM analysis. To this end, the numerical and experimental results were juxtaposed in the form of diagrams illustrating critical load versus eccentricity. Fig. 6 shows a relationship between the critical load and the eccentricity value applied in Direction e1, while Fig. 7 illustrates this relationship for Direction e2. The application of eccentric compressive load in Direction e1 reveals that the load eccentricity has a slight effect on the critical load value. Here, the highest stiffness of the column was obtained for the axial compression case – for ply orientation [0/45/−45/90]s – Pcr = 2986,4 N and for ply orientation [45/−45/90/0]s – Pcr = 4453,8 N; the stiffness slightly decreases with increasing the load eccentricity to the highest value of e1 = 10 mm: for ply orientation [0/45/−45/90]s – Pcr = 2478.7 N and for ply orientation [45/−45/90/0]s – Pcr = 3477.1 N, respectively. Given the two cases, the critical load decreased by 17% and 22%, respectively. A completely different behaviour of the structure was observed when the eccentric load was applied in Direction e2. With increasing the load eccentricity in the direction from the web of the column, the critical load decreases; for the eccentricity value of e2 = 10 mm, it takes the following values: for ply orientation [0/45/−45/90]s – Pcr = 1554.7 N and for ply orientation [45/−45/90/0]s – Pcr = 2177.6 N, which means that the critical force decreased by 48% and 52%, respectively. These values are much higher than those obtained when the eccentric load was applied in Direction 1. A significant change in the structure’s operation was observed when the eccentric load was applied toward the wall web of the column. With increasing the eccentricity of compressive load, the critical force also increases when compared to the eccentricity value of e2 = −6 mm (ply orientation [0/45/−45/90]s) and e2 = −5 mm (ply orientation [45/−45/90/0]s). The critical load increased in the following way: for ply orientation [0/45/−45/90]s – Pcr is 4022.9 N and for ply orientation [45/−45/90/0]s – Pcr is 5213.4 N, which is equal to an increase in the critical load by 26% and 15%, respectively. A further increase in load eccentricity leads to a decrease in the critical load; however, for the limit value of e2 = −10 mm, the critical loads were still higher than those observed for axial compression (Table 1). This means that the displacement of the compressive force axis towards the web of the tested channel-section column causes a significant increase in the stiffness of the structure, thus increasing its resistance to stability loss. The study also enabled the determination of the effect of laminate ply orientation on the critical load of the structure. As shown in the diagrams (Figs. 6 and 7), the change in orientation of the 00 plies from external (ply orientation [0/45/−45/90]s) to internal (ply orientation [45/−45/90/0]s) leads to increased stuffiness of the structure, which results in an approx. 33% increase in the critical load in the axial compression case. This trend does not change when load eccentricity is increased in the two tested directions. 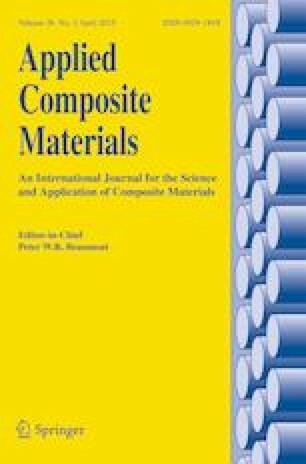 This paper presented the results of a study investigating the buckling of thin-walled channel-section composite columns under compression. The study examined the effect of eccentric load on the critical load of the columns. The results confirm that eccentric load has a significant effect on the buckling of columns under compression depending on the direction of load eccentricity relative to the centre of gravity of cross section of the column. When the eccentric load is applied in Direction 1 (Fig. 1), an increase in the load eccentricity leads to a decrease in the critical load; however, compared to the axial compression case, this decrease does not exceed 22%. A much more considerable effect was observed when the eccentric load was applied in Direction 2, where the load eccentricity was increased by moving the direction of action of the compressive force away from the web plane of the channel section column. In this case, the compressive load decreased by 50%. This was the most dangerous loading case observed in this study, as the structure was significantly loaded by the bending moment resulting from the eccentricity of the compressive force. A different behaviour of the structure was observed when the eccentric load was applied in Direction 2; nonetheless, the force shifted toward the web wall of the column. In this case, an increase in load eccentricity led to an increase in the stiffness of the entire structure, as demonstrated by a 15–26% increase in the critical load depending on the laminate ply orientation. The results also demonstrate that ply orientation of the laminate has a significant effect on the critical load value – in the axial compression case, this difference amounted to 33%. The experimental findings show quantitative and qualitative agreement with the numerical results, and the highest discrepancy between the results does not exceed 10%. This confirms that the developed numerical models of the tested thin-walled structures were correct. The research has been conducted under the project No UMO-2015/19/B/ST8/02800 financed by the National Science Centre Poland.